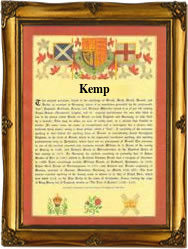 Recorded in several spellings including Cemp, Kemp, Kempe, Kemppe, Kempt, the patronymic Kempson, and possibly others, this interesting surname is English. It originates from the pre 7th century word 'cempa' meaning a champion, a title bestowed upon a champion of jousting or wrestling. The name is derived from the Roman word "campus", meaning a battlefield. The name development since the First Millenium includes the following recordings: Edmund Kempe of the county of Norfolk in 1099, Alan Kempe in the Hundred Rolls of Suffolk in 1273, Ralph le Kemp of Sussex in 1296 and Ricardus Kempe of Yorkshire in the Poll Tax rolls of 1379. Early examples of recordings taken from the surviving church registers of Greater London include the christening of Abiell Kemp on December 14th 1590, at St. Margaret's Westminster; the christening of Mary Kempt, the daughter of Joseph Kempt at St Giles Cripplegate, on May 21st 1667, and the marriage of Mary Cempe, to James Asskins as spelt, at St James Clerkenwell on June 20th 1667. A coat of arms granted to the nameholders has the blazon of a red shield, charged with three gold garbs and a gold border engrailed. The motto "Lucem spero", translates as "I hope for light". The first recorded spelling of the family name is shown to be that of Eadulf Cempa,. This was dated 902 a.d, in the list of Old English Bynames for the county of Wiltshire", during the reign of King Edward the Elder, of England, 899 - 924. Throughout the centuries, surnames in every country have continued to "develop" often leading to astonishing variants of the original spelling.